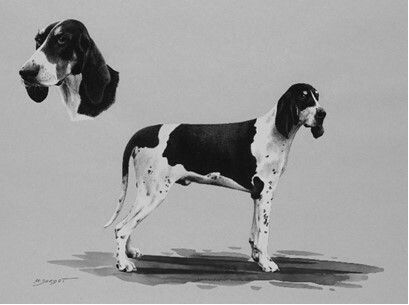 : The French White and Black Hound evolved from the Saintonge Hound whose origins are uncertain; while it has no connection with the Saint Hubert, there is probably a distant ancestry with the famous white “Greffier” dogs of the XVIth century. Appearing in the second half of the XIXth century, the present type was influenced by later cross-breeding with the Poitevin and the Gascon-saintongeois. It obtained its standard in 1957. At present, the breed counts approximately 2000 subjects, representing 300/400 births per year. The 2007 text was drafted by Mr. Pierre Astié, President of the “Club du chien d’ordre”, and his committee, in collaboration with Mr. Raymond Triquet. : Large pack hound, distinguished and of balanced build. : The muzzle is long compared to the skull. The length of the body, from the point of the shoulder to the point of buttock, is equal to the height at the withers. : These dogs are very appreciated by many deer hunts for the following qualities fine noses, diligence, seriousness and throat. It is a friendly dog, close to humans and easy to manage in the kennels. : Rather long, in harmony with the whole body without ever being heavy or coarse, but expressive and well carried. : Slightly domed, rather narrow without exaggeration. Occipital protuberance apparent without excess, but sufficient to avoid the skull appearing too flat. The superciliary arches can be slightly prominent. : Black. Nostrils well open. : Rather long compared to the skull; the nose bridge may be slightly arched. : The flews are slightly square; the upper lip just overlaps the lower lip. : Dark, intelligent and trusting expression. : Set at eye level, slightly curled. When pulled forward, they should reach, at least, the base of the nose leather. : Quite long and strong, with sometimes a slight trace of dewlap. : Rather long but well sustained. : More deep than broad and reaching the point of the elbow. Ribs long and more flat than round. : Quite thick at its root; carried relatively high. : FOREQUARTERS In line with the body; strong and rather flat. : Rather long, lean and resistant. : Long and sufficiently muscled. : Well let down, wide, powerful and slightly bent. : White under white hair, black under black hair with sometimes sub-cutaneous patches on the belly and inner thighs of blue or pale blue colour. : Obligatory white and black, with a black mantle or with more or less widely spread black markings and possible black or bluish speckling, or even tan freckles but the latter only permitted on the limbs. A pale tan dot above each eye as well as a pale tan on the cheeks, below the eyes, below the ears and at the base of the tail. The “roebuck mark” is quite frequent on the thigh. Head: Any indication of English Foxhound blood in the head (skull too voluminous, muzzle short and not sufficiently square at the end when seen from the side). Colour: On the cheeks, black extending to the lips.